But, little by little, and bit by bit. 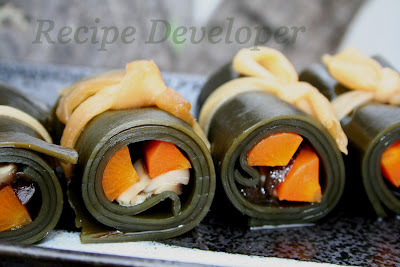 When I saw the big kelp package in the box, I was inspired to make Kobu-Maki right away. 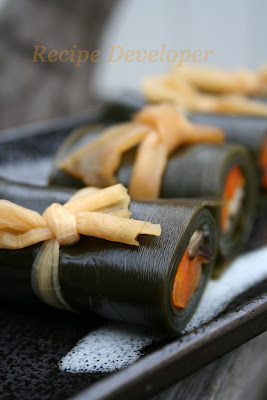 I soaked the kelp in the water and made until tender, then rolled carrots and shiitake mushroom in a piece of seaweed, and put Kanpyo (Dried Gourd) strip and tied the roll. Then I simmered the rolls in Dashi (Japanese broth), Soy sauce, Sugar mixture for 30min. This is a popular New Year's dish. Because Kom-Bu, it is the same pronunciation as "Yo-Ro-Ko-Bu" = to be glad in Japanese (English translation), it is said that kom-bu is considered to be a good luck type of food ingredients in Japan. That's why this dish is recognized as a New Years Dish. I only had carrots and mushroom that day, but I wish I had Gobo and Nishin ( Herring ) or so.